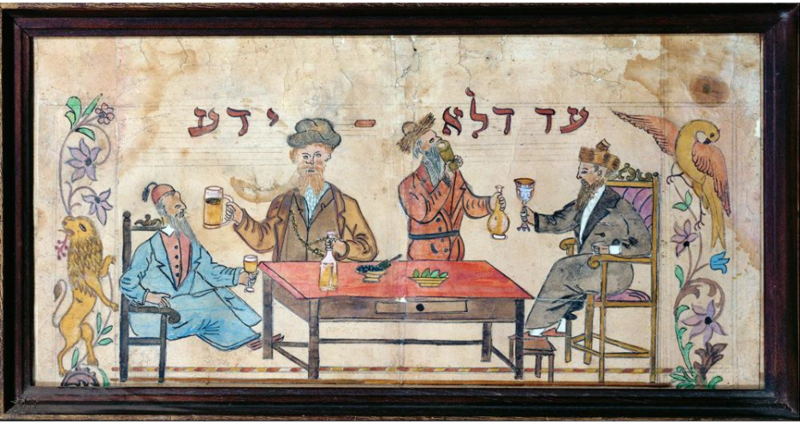 Four Ashkenazi and one Sephardi Jews are fulfilling the commandment to get plastered on Purim in 19th century Safed, a holy town in the Galilee. What is survival? For individuals, the answer is self-evident. It is the opposite of dying. But what is it for nations? That is a much more complex question. Very few nations survive today from antiquity. None of them are small, but one: the Jews. The Gentile nations that survive today are mostly in the Far East and in the Indian Subcontinent; nations that are exceedingly populous and have survived by clinging to their ancestral land and simply outliving their occupiers. That strategy is far from perfect, however. India allowed itself to submit with nary a fight to the Muslim Mughal invasion of the early 16th century. This submission gave us partition, genocide, the exceedingly dangerous Pakistan, the endless border dispute in Kashmir, and the troubles between the Hindu majority and very sizable Muslim minority within India. Hindu culture and the Hindi language were changed forever with multiple borrowings from the Arabic. The Indian cultures of pre-Muslim invasion are no more. Survival of small nations like the Jews over three thousand years of recorded history is all but unheard of in world history. They simply get absorbed into the vast tides of human migrations, succumb to the changing fortunes of empires, get seduced by newfangled prophets, their genes scattered among the vast gene pool that is the human race. The immediate question that comes to mind here is “who cares?” Who cares if the ancient Greeks are long gone and the modern ones have more Turkish in their culture than Greek? Who cares if the Latins, founders of one of the world’s greatest empires, left us their language and their architecture, but allowed themselves to be washed away in the sands of time? National survival is more complex than individual one because a nation is a projection of the individual on a larger canvass and because national survival is measured in centuries and millennia, not years and decades. A human individual is a package. He is the incarnation, literally the “fleshing” of genetic material passed to him by his ancestors, but that is just a vessel. Into this vessel are poured the contents of his tribe’s stories, histories, traditions, myths, religious practices, moral codes, legal codices, works of art, culinary tastes, loves and hates. A nation is simply a collection of individuals that share much of the above; the genes, the traditions, all of it. A collection of individuals that share no genes and no traditions, is no more a nation than the dwellers of a condominium high rise are a family. Such individuals may, for a while, be bound by geography, or by some fleeting commonality of purpose, or by necessity, or, simply, by expediency. The common desire to accumulate wealth does not make a nation. Neither does allegiance to certain political ideals, simply because no political ideals can withstand the test of time. From single cell organisms like amoebas, to complex ones like elephants and humans, we are all defined by the boundaries that surround us. Be it a protein membrane or an elephant hide, without this barrier to hold our genes together, there is no individual. So it is with nations. Even more than individuals, nations are defined by the boundaries between them and the rest of humanity. Once that boundary is breached, the nation is no more. National boundaries are much more difficult to maintain that individual ones. We are born with our skin; nations must tirelessly work to maintain theirs. What are the skins of nations made of? They are made of genes that are shared among the individuals that form the nation. They are made of the body of common knowledge, memory, traditions, and beliefs that are the common cultural “cart” of the nation. But most of all, they are made from the determination that is shared by all the individuals that make up a nation to maintain a space, be it physical, or spiritual, or both, that is the property of the nation EXCLUSIVELY. If genetic and cultural cohesion are the necessary condition for the existence of a nation, the willingness to enforce exclusivity, even at great cost, in fact, AT ALL COST, is the sufficient condition. Both must be met for a nation to be born and to survive. The Jews survived from antiquity because we have well above average cultural package and a truly unmatched commitment to exclusivity. The Torah, both “written” and “oral”, the Old Testament and the Talmud and all of the subsequent commentaries are nothing more than manuals on how to maintain exclusivity. Holidays are symbols. They symbolize the changing seasons, sowing and reaping, foundational dates and figures in the history of a nation or a religion. Most Jewish holidays are symbols of exclusivity. They are an oral tradition of maintaining exclusivity at all costs under the most challenging conditions. Today is the second day of the somewhat secondary, but the most joyous Jewish holiday of Purim. This second day is only celebrated in exile, because the royal verdict delivering the Jews from their arch-nemesis Haman took two days to reach the far-flung corners of the Persian Empire. But more importantly, what is Purim? Dressing up and eating triangular cookies? Generic victory of “good” over “evil”? No, let’s leave these platitudes to the “Reformed” and “Conservative” “rabbis”. Purim is about exclusion. When the Judean elites were exiled to Babylon (later Persia) in 600 BC or so, they did not mix with the locals, though (as recorded in recently found clay tablets), they became wealthy from dealing with them. Instead, they sat “on the rivers of Babylon” and “wept”, when they “remembered Zion”. When given a chance, some chose to return to Judea. Purim is an allegorization of that historical fact. It tells us that remaining exclusive comes at a high price, sometimes even nearly fatal price, but eventually it is worth it. That is the true meaning of the Purim holiday: exclusivity is hard, it is dangerous, but it works. When they made it back to Judea, the grandchildren of the exiled elites encountered the grandchildren of the regular Judeans who were of insufficient prominence to have been herded into exile. “Welcome home!” the farmers told the descendants of the priests and scribes and government officials. “It wasn’t easy without you, we didn’t really know how to sacrifice to our God, how to keep our traditions, but we did our very best! Let us show you!” “We want nothing to do with you,” was the answer. “You are impure and you are not Jews anymore,” they told them. Another lesson in exclusivity. The nature of exclusivity is antithetical to compromise. It is not nice. It is the opposite of nice; in fact, it is, more often than not, downright cruel. The rejected and dejected remnants became the Samaritans of New Testament fame. They kept the altar that they had built on Mount Gerizim in Samaria, where a few still sacrifice to the old God today. Five centuries after the return of the Jewish elites from Babylon, at the time of Christ, Samaritans were still looked down upon by Jews. They were the dregs of society, which is what the parable of the good Samaritan is all about. The downtrodden can be far kinder than the prominent, it so rightly tells us. Next month we are going to celebrate Passover, the ultimate tale of exclusion as a tool for nation building. The Israelites marked their doors with lamb blood so that the genocidally vengeful spirit of the Lord would pass over them on His way to kill the Egyptians’ firstborn. But how did they know that the Egyptians would not use this predecessor of the yellow Star of David or the modern social media ((())) sign to slaughter them instead? They didn’t, of course, but setting themselves aside and apart from the Gentiles, departing the America of the age, Egypt, for an uncertain, but exclusive (!) future in an unknown and well-defended land was more important than individual survival. The story of Passover, is not the story of the triumph of liberty over oppression. It is the story of choosing national survival over individual one, of the inadequacy of existence as “yet another Gentile” and the primacy of existence as the Chosen People. Of course, any people can be “chosen”. It is simply a matter of will. It is the one instance when the new-age adage of “if you can will it, you can be it” actually works. But only if you are willing to make the sacrifice, including the ultimate sacrifice of your life, but more commonly, of your career, your bank account, your love for a Gentile boy or girl. 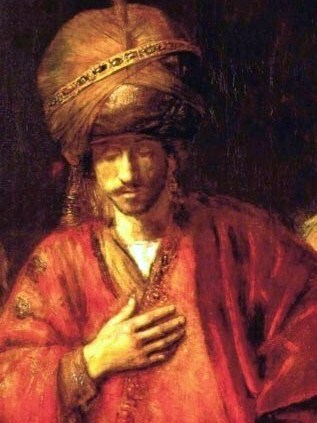 The Maccabees, of Hanukkah fame, took on the descendants of Alexander the Great and an empire that at the time rivaled Rome to maintain Jewish exclusivity. Hanukkah is not the “Festival of Lights”. It has nothing to do with latkes or donuts or eight days of candles. The menorah miracle is only a symbol, it is a mnemonic device for what is really important; the will to fight, against overwhelming odds, to maintain your national “skin”. To keep your own people in and everyone else out. A couple of centuries later, the Jews in Judea tried it again. But ascendant Rome at the peak of its imperial power was not the waning Seleucid Empire. The Jews lost. Catastrophically so. No donuts for this one, only ashes and fasting. But the idea of exclusivity was not discarded, it was transformed. From the physical to the intellectual. From the one Temple to thousands of synagogues, each with its own “memory stick”, a Torah scroll. The rabbis went to work devising new methods how to make Jews more exclusive, not less. More exclusive via dietary laws and laws on just about everything else. And that is why we survived. In the West nowadays, exclusion is a dirty word and so is its modern synonym: nationalism. Inclusion, multiculturalism are the now imposed by the fiat of the global elites. But it’s inclusion for thee, but not for them. Had, God forbid, a church in New Zealand been attacked as horribly as the mosque had been. Would Jacinda Ardern have donned a cross necklace? Had the slaughter occurred at a synagogue, would the New Zealand Muslims cancel Friday prayers as the New Zealand Jews had done? Somehow I doubt it. New Zealand women, following the example of their prime minister to wear the hijab are not showing “solidarity”. Solidarity with the victims can be shown in an infinity of ways, ways that do not include the subordination of one’s own culture to the exclusionary symbol of another. The human body is healthy when all of its individual cells maintain their integrity and cooperate for the benefit of the individual whose body they make up. Humanity is healthy when it is comprised of culturally and genetically distinct nations, each with its won culture and traditions. Exclusion is life eternal. Inclusion is oblivion. Jews have long chosen life. So should everyone else. Who pushes “multiculturalism” on all White Christian nations but REFUSES it themselves? I approved your comments though, needless to say, I rather violently disagree with them, because we believe in free speech and because your language was acceptable for publication. Thank you for reading and commenting. When Jews compel “inclusion” on Gentile Nations do not be shocked that Gentiles eventually impose inclusion on Jews. your ideas are very wrong and twisted. How did you reach such conclusions?